NO-AD Suncare Sunscreen Lotion has a SPF rating 45 and is made with Aloe and Vitamin E.
Advertências: For external use only. Do not use on damaged or broken skin. When using this product keep out of eyes. Rinse with water to remove. Stop use and ask a doctor if rash occurs. Keep out of reach of children. If product is swallowed, get medical help or contact a Poison Control Center right away. For use on skin only. Avoid contact with fabric. Sun protection measures: Spending time in the sun increases your risk of skin cancer and early skin aging. To decrease this risk, regularly use a sunscreen with a Broad Spectrum SPF value of 15 or higher and other sun protection measures including: limit time in the sun, especially from 10 a.m. -2 p.m. and wear long-sleeved shirts, pants, hats and sunglasses. Children under 6 months: Ask a doctor. For use on skin only. 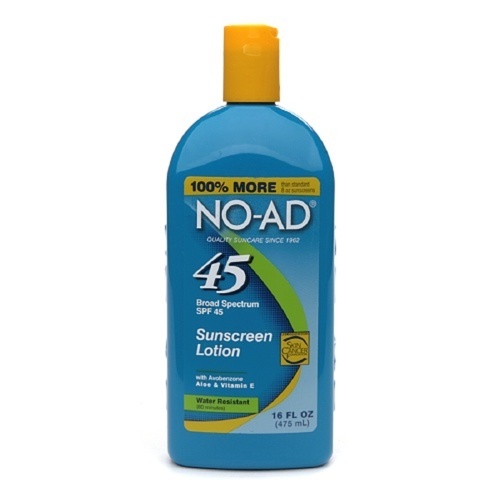 Recomendações de uso: Apply liberally 15 minutes before sun exposure. Reapply after 80 minutes of swimming or sweating, immediately after towel drying, or at least every 2 hours. Sun protection measures. Spending time in the sun increases your risk of skin cancer and early skin aging. To decrease this risk, regularly use a sunscreen with a broad spectrum SPF value of 15 or higher and other sun protection measures including: Limit time in the sun, especially from 10am - 2pm, wear long-sleeved shirts, pants, hats, and sunglasses. Children under 6 months: Ask a doctor. Protect this product from excessive heat and direct sun.